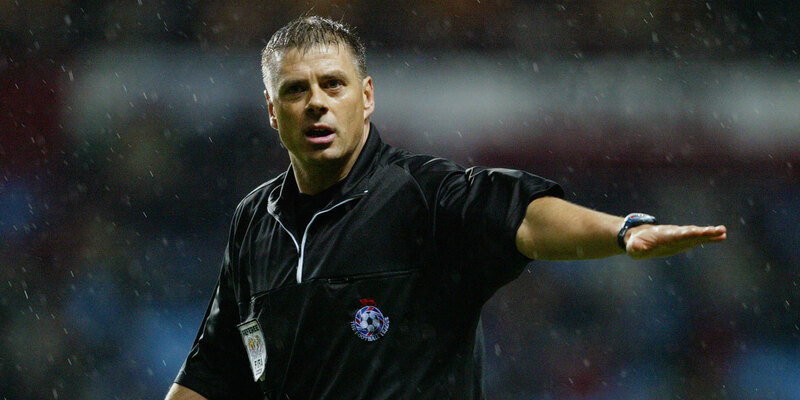 Mark Halsey was a Premier League referee for 14 years after taking up officiating in the mid-1990s. He took charge of the 2007 Community Shield and 2008 League Cup final. The 57-year-old was diagnosed with throat cancer in 2009 but returned to referee in the top flight a year later before retiring at the end of the 2012/13 season. bwin caught up with Halsey to discuss a range of topics from the rules of football, including the offside rule, fouls and VAR, to some of his memories on the pitch. Most difficult laws to monitor for a referee? I think it is a thousand misconducts. Lucky for me I wasn’t an assistant referee, but sometimes you have got to look at offside as it changes all the time. It is very difficult to interpret now with ‘is he involved in active play?’ or ‘is he interfering with an opponent?’. As a referee, law 12, you are looking at interpretations with fouls and misconducts. The game is changing all the time. It is so quick, the pace of football, especially the Premier League, is so fast today. It makes it very difficult for a referee to judge whether a challenge is careless, which is a free-kick only; reckless, which is a free-kick and a caution; or when a player endangers the safety of an opponent by using excessive force with brutality which is a red card for serious foul play. That is very difficult because of the pace of the game. Sometimes referees overreact and get the red card out straight away because the players are surrounding the referee, rushing in when they see a challenge on their team-mates. They make it worse for the referee, it is hard for the referee to judge that challenge when players are coming round to try and get that player sent off. Being a top referee in the modern era, you have got to be mentally tough, mentally strong and let the players know who is in charge, which is difficult. When I refereed it was about managing the game, managing the players, managing the event, getting the players on side, engaging with the players, talking with the players, laughing with the players, joking with the players. But they knew that when they overstepped the mark I would come down and stamp my authority on the game. Sometimes you see referees today not stamping their authority on the game, when needed. Yeah, there are times when you can manage and there are times when you can’t. There is a fine balance that the referees have to get in the modern era of football. That does not mean you have to necessarily caution a player, you can do it verbally and give them a public rebuke so everyone knows you have spoken to him about an incident that has taken place. It is easy to give direct free-kicks. Law 12 is difficult. If there is contact it is always a direct free-kick. Sometimes it is difficult. All players have the right in their position on the field of play, but standing in the way of an opponent is not the same as moving into the way of an opponent, impeding the progress of an opponent, moving into an opponent’s path, playing in a dangerous manner. That can mean anything. If you have a high boot and don’t make any contact, then you could judge that as an in-direct free-kick. But if you are playing in a dangerous manner, your boot is high and you catch someone, then that can result in a red card, which we have seen with Sadio Mane against Manchester City last year. It is a fine line. Generally, you don’t see too many in-direct free-kicks for playing in a dangerous manner or impeding an opponent because there is normally contact. A free-kick to the defending team outside the penalty area, a defender kicks it back to his goalkeeper, who misses it, doesn’t touch it and it goes into the back of the net, what do you do? How do you restart play? You restart play with a corner kick because you cannot penalise a defending team twice. A lot of people would not know that. You would say that is one of the most obscure ones. You can’t score direct from a throw-in, unless it touches an opponent, and you cannot score direct from a goal kick, but you can score if the goalkeeper kicks it out of his hands. Any laws players complain about the most? Players are always complaining, ain’t they? Modern day now, I think you are looking at handball, is it deliberate or is it not deliberate? What a lot of people don’t know about handling the ball is that handling the ball involves a deliberate act of a player making contact with the ball with a hand or arm. As a referee, the following must be considered. The movement of the hand towards the ball, not ball towards the hand, the distance between the opponents and the ball and this is the main one. You hear a lot of commentators saying ‘his arms were in an unnatural position’. Now, there is no mention of natural or unnatural position in the laws of the game. All it says is that the position of the hand does not necessarily mean there has been an offence committed. So, we saw numerous penalties given for handball from recommendation from the VAR to a referee to review the monitor at the World Cup. They just weren’t deliberate and we saw many injustices where penalties were given when they should not have been given, with VAR involved when it shouldn’t be as it has to be a deliberate act or a clear error. I suppose the other one where there is confusion is the offside rule. It confuses people. I think the law is sound now, you want to see more goals now, but the interpretation in the English league differs to Europe and the rest of the world. Any laws that referees overlook? Shirt pulling, the pros expect a certain amount to go on but they want the obvious ones picked up, where you man-handle them to the ground. Yes, little bits of pulls go on here and there, which is part and parcel of the game and the players expect those to be let go. It is when you see the really obvious ones that are not given, the blatant ones. Another one you do see, and a lot of people complain about, is encroachment in the penalty area and goalkeepers moving off their line at penalties. With goalkeepers, that first step you have to step forward to push off to make a save. You can’t just dive standing and leaping from your line. You have always got to make those one or two steps. As a referee, I have always allowed that. I think in all my career I never had a retake. As a referee, I always used to think to myself ‘don’t go looking for trouble because trouble will find you’. That was always one of them. In fact, I think I only had a retake once, at Leyton Orient, many years ago. The player took the penalty, thought I was ready, but I had to order a retake. If you look at every penalty you can always say ‘there should be a retake there’ because of encroachment but it is one law where we try not to get involved. Another one people look at is the six-second rule when the goalkeeper has the ball in his hands. Once he has got the ball in his hands the law says six seconds but you never penalise that because both goalkeepers do it and if you do it and they score, the amount of abuse the referee would get in that situation… You tend to use your common sense and manage the situation. How has the style of football impacted the laws? The game has changed from when I first started. When I started, that was when the reckless and excessive force challenges came in, the challenge from behind and all those sort of things. Over the last 20 years it is different. We are there to protect the players, that is what referees are there for, but at the same time we do not want to take tackling out of the game. We have got to allow tackling in the game. The problem now is there will be defenders making challenges for the ball and cooking up cheap yellow cards, when perhaps they have made a genuine attempt at playing the ball, but sometimes their trailing leg catches the player. That with challenges and the pace of the game has changed, they are athletes now. I think the pressure on modern-day referees over the last five or six years, the scrutiny of TV and media on referees’ decisions, their decision making and different replays from certain amount of angles. The game as we know and love it has gone and we are entering a new era. VAR will start coming in more and more. Which law would you change in football? We have seen the double-jeopardy law come in now, which is good, when a player makes a genuine attempt to play the ball which results in a yellow card. That just applies in the penalty area, but if a player makes a genuine attempt outside as well that should be a caution as well. If there is one rule I would change is a goalscorer’s celebrations. We are in the entertainment business and fans pay a lot of money to see football matches. If a player wants to take his shirt off and celebrate a goal, let him do so, as long as he has not got a shirt underneath with a political slogan on. That is one rule I think we should change because it is entertainment. Players’ emotions of scoring a goal, it must be a fantastic feeling when you score a wonder goal and celebrate with your fans, why not be allowed to take your shirt off? As long as there is not a political vest underneath with a slogan on, then fine. If there is then that is different and yes the referee needs to caution that player. But you don’t generally see that today. Nine times out of 10 they have the same colour under armour underneath their shirt. If there is one law I would change that would be it. Listen, you have got some really good referees. From the World Cup, the Argentinian referee Nestor Pitana. I thought he refereed well throughout the World Cup. He was unlucky in the World Cup final, I think he felt under pressure with the handball with the VAR. 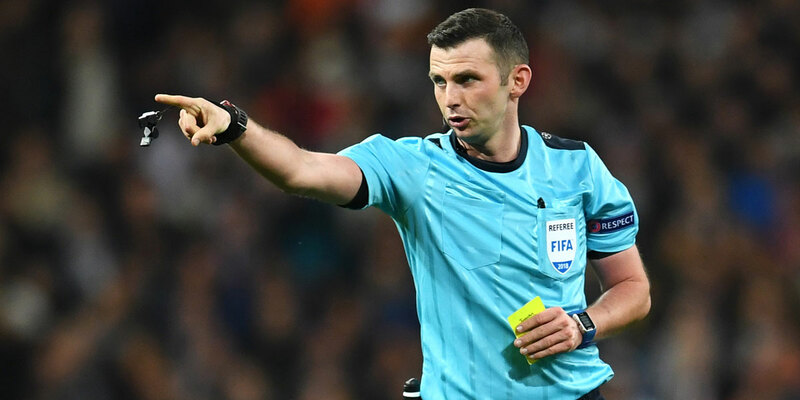 In the UK, it was disappointing not to see Michael Oliver in the World Cup. He is good enough and better than a lot of them out there. In the Premier League, Michael Oliver is undoubtedly our number one since Mark Clattenburg went. In Europe, Cuneyt Çakır from Turkey, I think he is a very good referee. The German referee, Felix Brych, and the Dutch referee, Bjorn Kuipers, and Damir Skomina as well. In Europe you have got those guys who are the best around. Eventually when you see Michael do more Champions League games, getting more experience, you will see him rise above. He has got the potential to be the best in the world, in my opinion. His recognition of offences – careless, reckless, and serious foul play challenges – is very good. The players trust him and that is very important that they trust the referee. He knows how to engage with the players, he smiles with the players and laughs and jokes with the players, but when he needs to he stamps his authority on the game. As a player that is all you want. You need to know where you stand and players know their referees. Michael Oliver is one of our most respected referees, along with Andre Marriner, Martin Atkinson and Mike Dean, who are always very consistent. We have missed Lee Probert, he has had a couple of years out injured, but he is getting himself back now. He is another one who players trust and they like as he doesn’t overreact. What is a fourth official’s role? They are there to manage the technical area. It is difficult as when something goes on both managers come at you. You have just got to manage them, humour them, and work with them because you don’t want to put them in the stand. You have got to realise the frustrations of managers, their emotions, with their jobs on the line. You obviously cannot condone it if they do step out of line but it can be difficult. You cannot make any decisions on the field of play when you are not the referee. Obviously, everyone is mic’d up and you can alert the referee to a missed act of violent conduct so you can inform them of that if something goes on. You can get involved. If something goes on on the halfway line and there is a foul and he is back in the penalty area and cannot get there and the assistant has not picked it up, you can shout ‘foul, foul, foul’ and help him. But you have got to be careful as the two dugouts can see or hear you. The managers know the referees, they know who they can talk to, and you have got to be able to let them approach you and not overreact. Get them on your side. If you get them on side and don’t overreact, and you are pleasant with them with a smile, they will work with you. Would you like to see referees wear cameras? I’m not sure that will ever happen. You could use it as a training aid. It would be very helpful for a referee with his positioning and movement. But I cannot see FIFA allowing that to happen. Yes, it would be good but I can’t see it. Did you like to see the game flow or blow up for fouls? You have to tempo-manage the game. People know I was a referee who always allowed the game to flow. But you have got to be careful not to let it run away from you. When the challenges start going in, and you play advantage when you shouldn’t, it could jeopardise your control. It is getting that fine balance and not letting the game run away from you. 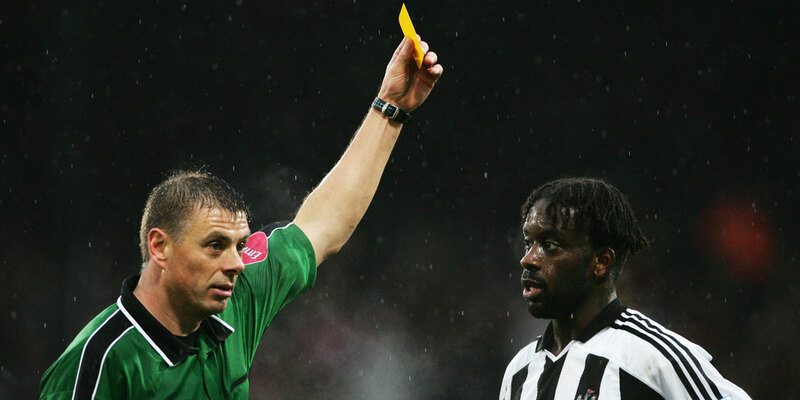 The players dictate how a referee referees a football match. If they want to get on with it and don’t want to become niggly and have little niggles with opponents, then great, you just conduct the orchestra. Once they start getting niggly, losing their temper, losing their discipline, then that’s when referees have to step up their profile and bring it back down again. They have to be proactive, helping and talking to players, saying things like ‘hey, calm yourself down, don’t go in so hard, be careful’. It is better to be proactive, talking to the players all the time, than never saying anything. A referee that is arrogant and doesn’t want to engage with the players. The last thing the players want is an arrogant referee, players like referees to work with them, talk and help them. And I always found that worked for me. How easy is it to make an off-the-ball decision? It is very difficult for the referee when you get an off the ball behind your back. If things are going on, you know things are going on, you are in communication with your assistants. They can say ‘hey, watch nine and five, they are at it all the time, something can go on behind your back, keep your eyes on them when you can’. You are always doing that. You always know if there is an off-the-ball incident that the camera will pick it up and the FA will take retrospective action if there is an act of violent conduct. The FA will take action on an incident unseen by the match officials. Has anyone ever tried to influence your decision? I had it once at Fulham v Arsenal, where I gave a penalty and my assistant said to me it wasn’t a penalty. I went with my assistant referee and I should have stuck with my decision. I learned from that day, I did it once and never did it again. Looking at it, I could have got away with giving a penalty but everyone makes mistakes and you learn by them. That’s the same with everything, players, managers in all sports, you make mistakes and learn by them. I did change my decision once and got wrapped over the knuckles for it by my assessor, but you learn. I never did it again. After refereeing a game, do you analyse your performance? Yes, you do. When you are driving home from a ground, and there are certain incidents which happened, you replay it through your mind. You have the delegates from the game talk about it in the dressing room after the game and you talk to them about your decision making. When you replay it back through your mind, you do look at key match incidents when you go home and look at the DVD, watch Match of the Day or watch highlights of the incident on television to see if you got it right or wrong. If you got it wrong, you look at why you got it wrong. You look at positioning, angles, did you give yourself a good viewing angle, your movement and positioning and where were you at that time, could you have got into a better position, could you have got quicker off the mark, could I have anticipated the next phase of play quicker, all sorts of things you look at to try and improve your quality and decision making. None of us wanted to get big key match decisions wrong because it hurt us if we did get them wrong. 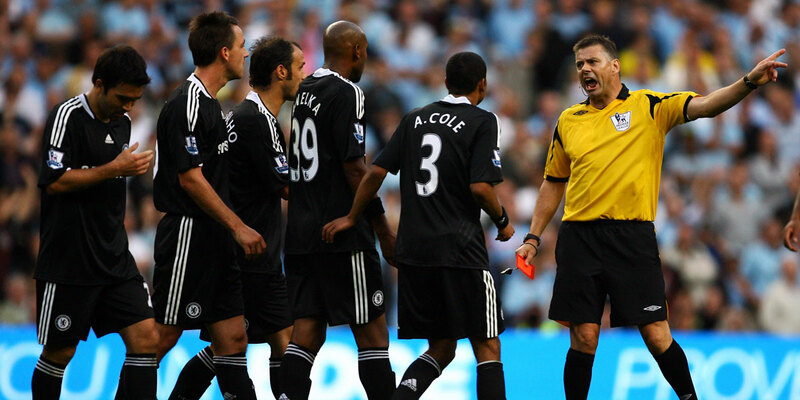 Do you think Premier League referees will ever have shirt sponsors? I don’t see why not, they have them on the sleeves, but that is an FA decision where they don’t allow that at present. But you see it in most other sports with sponsors on the front of the shirts. I don’t see why referees don’t. It brings in more sponsorship money to help them train younger referees to get them through to the top quicker. Why not? We need more coaches in the game, more quality coaches, as there is a lack of quality coaching at the top level, so if the more funding we get from sponsorship deals, so be it. Let them have it on the front of the shirts. Does the Premier League need VAR? The game we know and love has come to an end and we are into a new era now. I think it will come, we have seen a number of instances this season where VAR would have overturned decisions. Listen, it is a multi-million, billion-pound business and everybody wants to see the correct decisions. I think it should enhance our games. Forget it. The game is difficult enough as it is for referees. Let’s just leave it as it is. We have got a wonderful product, a wonderful sport, let’s just leave it as it is. We don’t need no green cards. Yellow and red cards, that’s what we know. Sin-bins? It is difficult, for me no. Just leave our game as it is. It is a fantastic product that we have got. How would you describe your own refereeing career? I thoroughly enjoyed my career. I walked away with my head held high. I didn’t go on too long as I retired at the right time. I could have stayed on and refereed for the money, but I think I had the respect of everybody in football, especially from managers and players. And I still get that respect now. I reached the top, I was a FIFA referee, an elite referee, and I enjoyed every minute of it. I am grateful to the Premier League for letting me be a professional. Any advice to give to an up-and-coming referee? Go out, enjoy it and smile. You never stop learning. Hopefully you learn from your mistakes, but go out and referee with a smile on your face. Do you remember favourite games? A lot of people say that, but I’ve had many games. Liverpool and Manchester United, all the top games, but there is one that stands out in my memory. It was after I took time out to battle cancer and I was told if I survived I would never referee again at the top level, and I did. I came back and refereed in the Premier League and I will always remember my first game was Wigan v Blackpool at Wigan. The standing ovation I got was fantastic. Every ground I walked out at that season I got an absolutely fantastic standing ovation. That game will live with me for the rest of my days. Certain football grounds where I got these ovations was fantastic. The best and worst players to referee? I got on well with all the players. Sometimes you have your moments but there were some fantastic players around that I had the privilege to referee. I don’t think it would be fair to name some of them, but those players know who they are. I have to say I got on well with many players. Yes, we had our moments on the pitch where we had words but that is how you control players. But we always come off with 22 handshakes. I certainly had my moments with one or two players in the dressing-room area, which no-one except my colleagues saw, but other than that I got on very well with everybody. Favourite ground to referee at? I loved going to any ground, whether that was in League One, League Two or the Premiership. 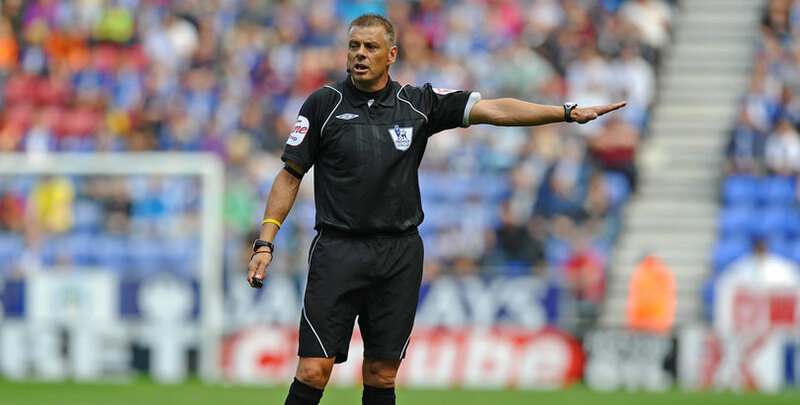 League One and League Two clubs deserve the best referees as well as the Premier League clubs. Every ground I went to I loved, some fantastic atmospheres. I always remember my first game back in the Football League, I think it was at Rotherham, when they played at Don Valley, and the reception I got was brilliant. The atmosphere was absolutely fantastic, it was against Notts County. I always remember there was a letter in my dressing room from Ronnie Moore saying ‘Welcome back Mark, it’s great to have you back, really pleased’. I will never forget that, it was brilliant.